The Swanson Speed Square first made by Swanson's founder in 1925. This innovative gadget combines 5 tools into 1: a try square, a miter square, a protractor, a line scriber, and a saw guide. Our Speed Square is constructed of durable heavy-gauge aluminum alloy guaranteed to last. Black-filled gradations stand out against a matte finish for easy reading. Includes markings for Swanson One-Number Method of rafter layout, and is packaged with the Swanson Blue Book of Rafter Length and Roof Construction. Look for the Diamond. Tbook.com crawls the web to find the best prices and availability on Layout Tools and related Tools and Hardware products like Swanson 7 inch Speed Square Layout Tool with Black Markings and Blue Book. For this page, related items include products we find that match the following keywords: "Layout Tool" at our vendor partner Home Depot. 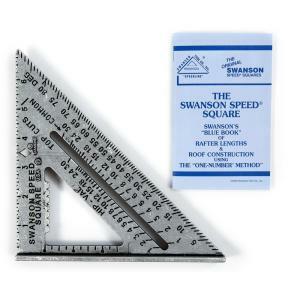 Swanson 7 inch Speed Square Layout Tool with Black Markings and Blue Book is one of 4 Layout Tools and related products listed in the Tools and Hardware section of Tbook.com If you have any questions on this product, please give us a call at 734-971-1210 during the hours of 9am - 5pm EST for assistance. Thank you for shopping at Tbook.com, the Internet Department Store!